I think it goes without saying that after Monday night’s dancing I was fairly wiped out Tuesday morning. I really enjoyed looking at everyone’s pictures from the event via Twitter. The above is one of my favorites. 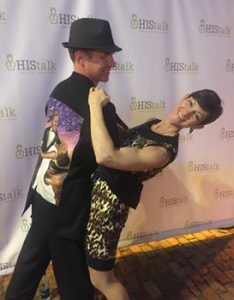 Power health IT couple Ross and Kym Martin make it look so easy, don’t they? But, as HIMSS-goers know, you find a way to power through, buoyed by the knowledge that throughout the day you’ll run into friends you haven’t seen since the last conference, have promising conversations with potential business partners and prospects, and, hopefully, learn a little something about an industry that paradoxically strives for moonshots but implements them at a glacial pace. And speaking of glaciers, Tuesday was unbearably cold. I was glad I packed a shawl, because I stayed wrapped up in it the entire day. My morning officially kicked off with a HIMSS-hosted roundtable focused on women in health IT. It was an amazing table to sit at. 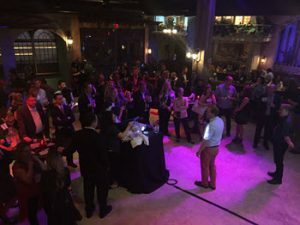 I was surrounded by judges and winners of this year’s inaugural Most Influential Women in Health IT Award, who talked about what receiving the award meant to them, advice they might offer to younger women looking to move further up the corporate ladder, and how to make the awards program more actionable throughout the year. I was pleased to hear that HIMSS is looking into building out a mentoring program, and pulling its state chapters more into the overall effort. Nursing informatics pioneer and IBM’s Senior Advisor of Healthcare Informatics Marion Ball: "Help promote your fellow female colleagues." As the admittedly most senior woman in the room, Ball emphasized that this wasn’t a common occurrence in her day, and thus is more important than ever. Former National Coordinator Karen DeSalvo, MD: "Enjoy the journey. Be open to new opportunities. Focus on what you want to do, not necessarily what you want to be." DoD Acting Assistant Secretary of Defense for Health Affairs Karen Guice, MD: "Step out of your comfort zone. Don’t be afraid to fail. Even your failures can be some of your life’s greatest moments." CHIME VP of Education Adrienne Edens: "It’s important to realize just how influential women are. We can make such a huge difference if we are intent about spreading that influence." Verizon ED of Enterprise Solutions Helen Donnelly: "Never stop learning. Be the person you needed when you were younger." It was so gratifying to be in a room full of accomplished women, each of whom mentioned her desire to ultimately make the world a better place by giving back. After that, I spent some time with the ladies above talking about mental health tech. It’s definitely a growing space. Consumers are already paying attention and providers are catching on as the industry attempts to better integrate primary and behavioral healthcare. I had the opportunity to chat with Christine Moberg, head of psychology at startup Pacifica Labs, which has developed a consumer-facing app to help patients cope with anxiety and depression. The company announced an early-stage funding round alongside a measurements-based, provider-facing version earlier this week, as well as an impending teletherapy feature. 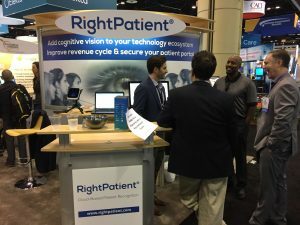 My walk around the exhibit hall included a stop at the Georgia Pavilion, where I chatted with the folks at RightPatient about the current state of biometric patient identification technology. 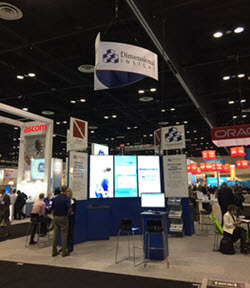 Dimensional Insight had a nice set up. 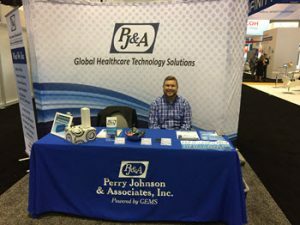 Coding services company PJ&A had a prime booth location. The friendly rep and I chatted about our similar experiences of having a small booth in a high-traffic location. I wonder if they spent as little as we did? 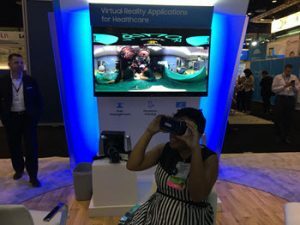 I snapped this pic of @innonurse trying out McKesson’s virtual reality surgery demo. You can see what she’s seeing on the screen behind her. It was pretty cool, though I didn’t stay to try it out because the idea of putting on a device that’s been worn by dozens of others grossed me out a bit. 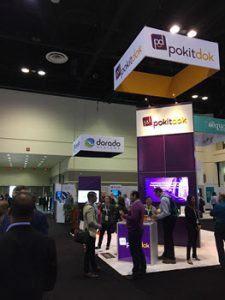 PokitDok’s booth looked busy. I wonder if they’re getting a lot of questions about their blockchain technology? 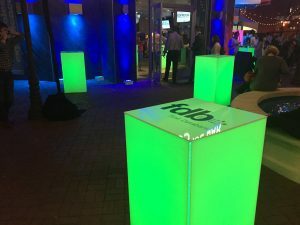 It’s a buzzword/hot topic that seems to be coming up quite a bit this year, along with security, AI, and telemedicine. I’m bummed I won’t make the concurrent blockchain conference going on Wednesday. 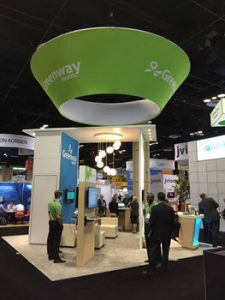 Greenway seems to have a much smaller booth in year’s past. The company has been very quiet over the last 12 months in terms of news, though they did announce new care coordination services from Orlando. I’d love to tell you more about them, but my WiFi connection is so atrociously slow that I can’t access the release in a timely manner. 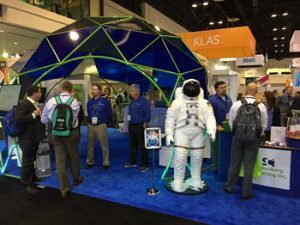 Stoltenburg Consulting had a cool space theme. I’ve been in their dome before. I seem to remember it having a jungle theme several years ago. I always like to see how marketing folks repurpose their spaces year after year. I may have found MedData’s rival in baked goods. Black Box had tasty, fresh-baked M&M-filled cookies at its booth. I was happy to taste test. 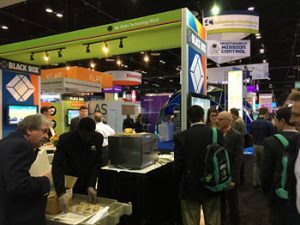 Hunger pains now at bay, I headed over to the Athenahealth booth (one of two) to chat with New Jersey-based Summit Medical Group CIO Paul Shenenberger. Part of Summit Health Management’s MSO, the 700 hundred-plus-physician medical group has seen explosive growth over the last several years thanks to integration (he wouldn’t use the word "acquisition") and organic growth. "We’re the anti-hospital," he said, "perfect for physicians who don’t to move over to the dark side of hospital employment." Aside from communing with the Athenahealth team, Shenenberger hoped to hit the show floor looking for security solutions and telemedicine offerings, though he was quick to add that Summit is currently looking at telemed startups that are already part of Athenahealth’s More Disruption Please program, including Hale Health, Chiron Health, and SnapMD. "We’re not looking at big telemedicine vendors," he explained, no doubt referring to American Well, Teladoc, and the like. "They want to use me to eliminate me," he added, explaining that, "the primary care physician is a commodity and the price is going down." 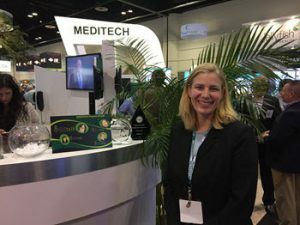 My next stop was a pleasant chat at Meditech’s booth with Beaufort Memorial Hospital (SC) CMIO Stacey Johnston, MD, a Meditech super user since her residency days. Johnston regaled me with the trials and tribulations of a rolling go live ("They never seem to end.") and the benefits of a big-bang strategy, which she led her team through last year when the hospital went to Meditech 6.1. Her non-Meditech-related HIMSS priorities include conversations with MModal and Nuance, both of which are interested in helping the hospital bring down its transcription costs. Though the organization is in the middle of an IT buying freeze, Johnston is already looking to free up funds for an integrated patient portal and better sepsis surveillance technology. 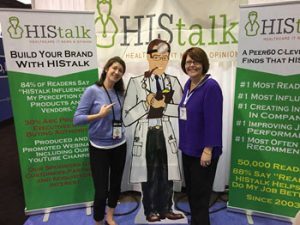 My last stop of the day was back at the HIStalk booth to spend time with WebPT CEO Nancy Ham, who kindly doled out career advice to several folks that stopped by. 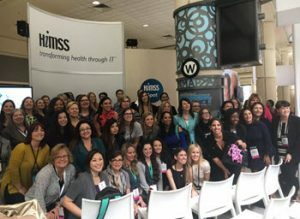 The conversation at one point veered into the challenges women in the investment world have historically faced in light of many veering onto the "mommy track," the differences between mentoring men and women, and the need for salary negotiation training — a topic that has come up in every women-centric event I have attended at HIMSS thus far. 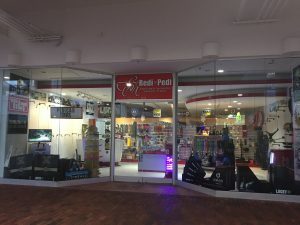 After a quick shoe change at the hotel, I walked across the street to Pointe Orlando and detoured into the shopping area. I had to snap a pic of this pedicab storefront, given that I have never seen anything like it. They seemed to be a popular form of transportation for those leaving the area to head to condo rentals a mile or so away. Every time I see a pedicab, I think of this Portlandia skit. The area was hopping with parties. 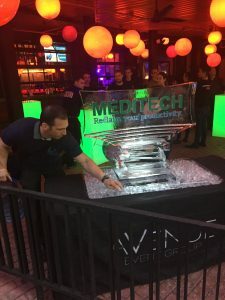 Meditech obviously invested in a nice ice sculpture. The New Media Meetup had a nice crowd. There seemed to be far more social media enthusiasts than influencers, which made me wonder what type of ROI sponsor Stericycle Communications hoped to get from the event. First Databank looked prepped to show customers a good time. I had hoped to make it to Imprivata’s party, but decided to head for the hotel when I found out it was not within walking distance. It was nice to turn in somewhat early and get a solid seven hours of sleep. I know it’s not the norm at HIMSS. This session was also very effective.